That beautiful car is a brand new 1906 Oldsmobile Model B Runabout. Yep, Bob Ferry used Googles Books to find old magazines that described mechanics, showed pictures and gave descriptions of the Oldsmobile so he could build it a 100 years later. There's like a gazillion books (over 3 million) on Google Books, making it a treasure trove of information that's easily searchable, diggable and findable. 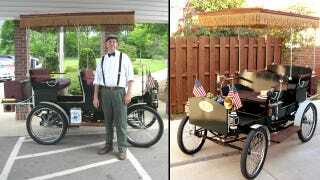 Perry, who is a 51-year-old machinist, found out of print issues of Popular Science and Popular Mechanics and books like Harper's gasoline engine book to create an original a replica as possible. He downloaded over a hundred Google Books to his iPad and started building.